Metallurgical treatment processes for molten metals carried out under vacuum, such as degassing, deoxidizing, decarburization and alloying, inside the melting furnace and outside of it in transport and pouring ladles. Pouring itself is frequently performed under vacuum. Regarding steel, vacuum metallurgy is often synonymous to secondary metallurgy. Fig. 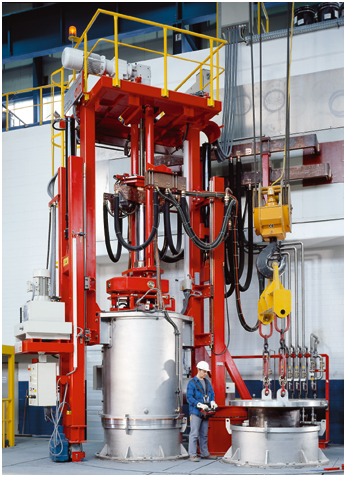 1 shows a vacuum arc remelting furnace, Fig. 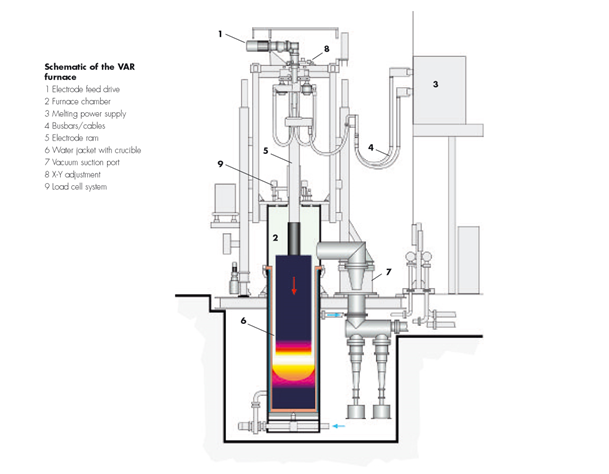 2 a schematic representation of this furnace. Above all, maintaining a melt under vacuum promotes degassing and prevents interfering reactions with atmospheric oxygen. In addition, vacuum metallurgy removes unwanted accompanying elements introduced into the alloy during previous manufacturing stages. In the VD process for ladles, for example, the liquid steel is degassed by means of inert gas in a ladle contained in a vacuum chamber. The inert gas serves as a scavenging gas and agitating agent under vacuum and causes turbulences in the melt, creating a larger reaction surface between the liquid steel and slag. This method is used for all steels. The abbreviation VD stands for vacuum degassing.